The Battle of Peach Tree Creek marked the beginning of the end for the Confederacy, for it turned the page from the patient defense displayed by General Joseph E. Johnston to the bold offense called upon by his replacement, General John Bell Hood. Until this point in the campaign, the Confederates had fought primarily in the defensive from behind earthworks, forcing Federal commander William T. Sherman to either assault fortified lines, or go around them in flanking moves. At Peach Tree Creek, the roles would be reversed for the first time, as Southerners charged Yankee lines. The Gate City, as Atlanta has been called, was in many ways the capstone to the Confederacy’s growing military-industrial complex and was the transportation hub of the fledgling nation. For the South it had to be held. For the North it had to be taken. With General Johnston removed for failing to parry the Yankee thrust into Georgia, the fate of Atlanta and the Confederacy now rested on the shoulders of thirty-three-year-old Hood, whose body had been torn by the war. 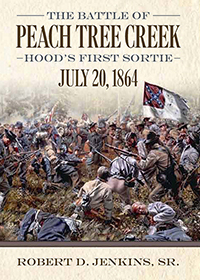 Peach Tree Creek was the first of three battles in eight days in which Hood led the Confederate Army to desperate, but unsuccessful, attempts to repel the Federals encircling Atlanta. This particular battle started the South on a downward spiral from which she would never recover. After Peach Tree Creek and its companion battles for Atlanta, the clear-hearing Southerner could hear the death throes of the Confederacy. It was the first nail in the coffin of Atlanta and Dixie.